More and more people are using their stand up paddle boards for SUP fishing. Fishing from a stand up paddle board is a new fishing method that many anglers alike are trying because of the several advantages SUP fishing offers. Since this new fishing trend has taken off, paddle board companies are designing SUPs specifically with fishing in mind. The best SUP for fishing is wider with a more stable platform and come with a plethora of features to help you catch more fish. Paddle boards are coming equipped with fishing rod holders, accessory mounts and bungee systems to carry everything you would need to support your angler needs. Besides the well-designed fishing SUPs, the pure functionality of fishing from a SUP can be more advantageous than fishing from land, a kayak, and even a boat. Below, we are going to discuss which stand up paddle boards are best for SUP fishing. The paddle boards discussed provide a solid range of price points and options for various experience levels. However, before we start reviewing the best fishing paddle boards, we are going to explain which SUP construction is best for SUP fishing. Inflatable paddle boards are generally better than epoxy paddle boards for SUP fishing. An inflatable SUP board is typically 6 inches thick whereas most epoxy paddle boards are only about 4 inches thick. This means that standing on an inflatable SUP will lift you higher up on the water than epoxy paddle boards. Standing higher above the water offers many benefits for SUP fishing. A thicker board will provide you with more stability when paddling, casting and navigating around your idle or anchored SUP effortlessly since your center of gravity is distributed over a larger base of support. Standing higher up on the water will give you a better field of vision of the fish swimming around you. The six-inch thickness will keep you and your gear high and dry on the water. Another benefit of fishing from an inflatable paddle board is that they are much more durable, portable and lightweight than epoxy paddle boards making them easier to transport. The highest quality inflatables are constructed with two layers of military grade PVC. This means you can drop your fishing SUP as many times as you want on the pavement, and it will not be damaged. When deflated, inflatable paddle boards roll up to the size of a sleeping bag and fit into a carry backpack along with your travel paddle, pump and leash. Compared to a kayak or boat, an inflatable requires much less storage space and is heaps easier to transport to and from your house. The best stand up paddle boards for SUP fishing are inflatable paddle boards that will make your SUP fishing experience comfortable and effective. 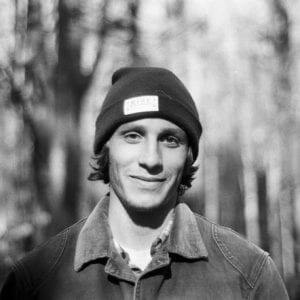 The stand up paddle boards listed below are all inflatable SUPs and each offer something unique. 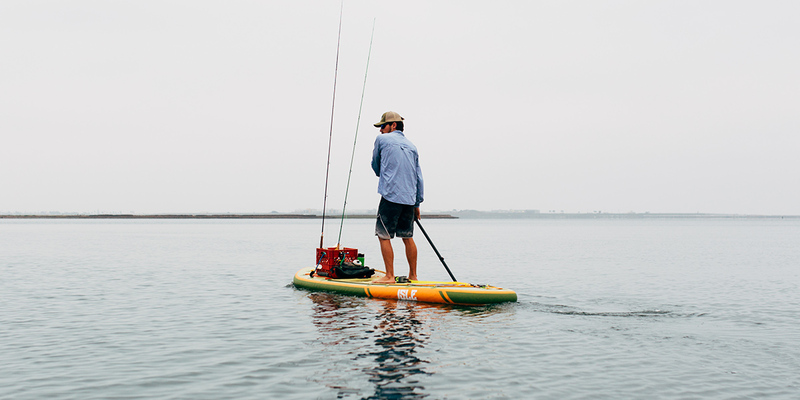 The Sportsman Inflatable Fishing Paddle Board was purely designed with SUP fishing in mind. 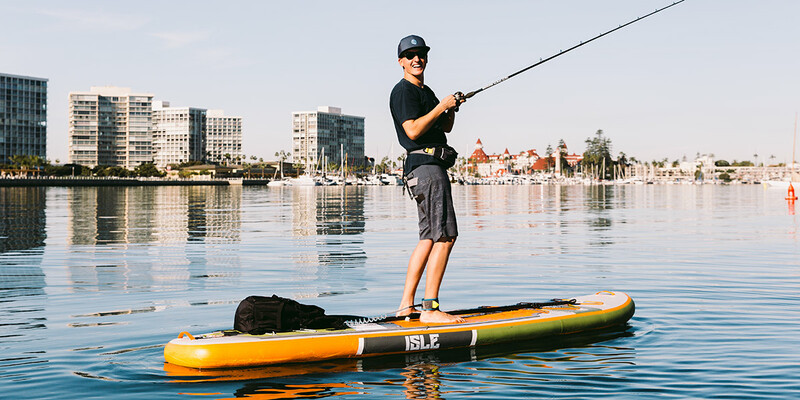 This inflatable SUP comes equipped with three Scotty Mounts to attach fishing rod holders, bait trays, a GoPro mount and more. In addition, the Sportsman comes equipped with two bungee systems (nose and tail) and several d-rings to secure a cooler, tackle box and any additional fishing gear you want to bring with you. The Sportsman has an extra wide outline, giving you more space to comfortably navigate around your paddle board. This inflatable paddle board is a perfect choice if you plan to frequently use your paddle board for SUP fishing. However, As an added bonus, the Sportsman can also be used as a recreational paddle board. The Explorer Inflatable Paddle Board is a great example of a paddle board that was not designed specifically for SUP fishing, but still gets the job done. The biggest difference between the Sportsman and the Explorer is that the Sportsman has scotty mount attachments and a wider outline. 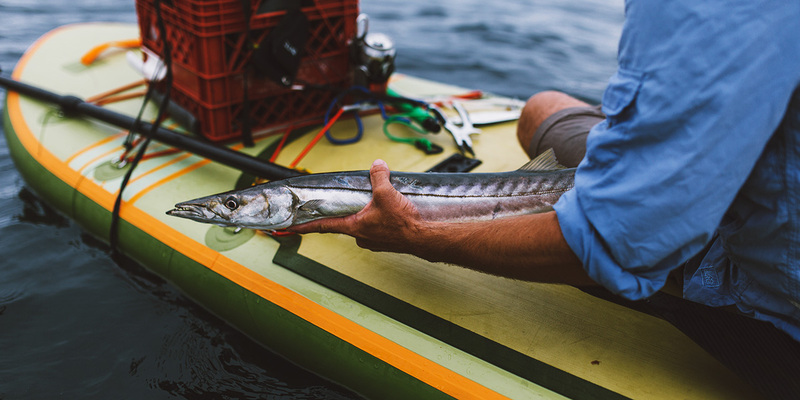 Like the Sportsman, the Explorer comes equipped with two bungee systems (nose/tail) and several d-rings to secure your whole fishing setup to your SUP. The Explorer is the best SUP for fishing for those who want more versatility out of their paddle board. 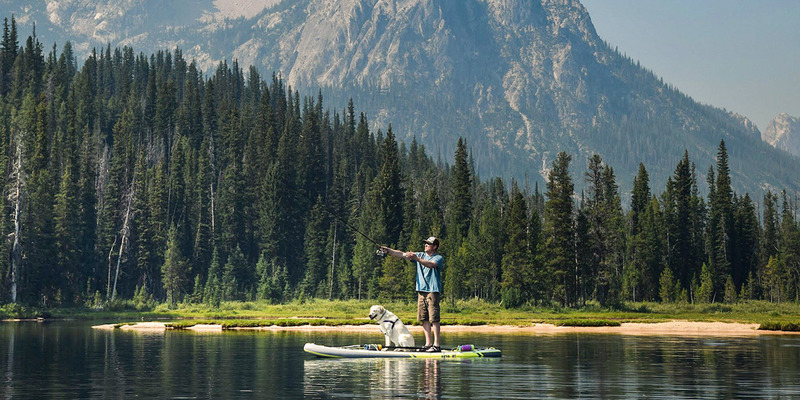 Not only can you use your Explorer for SUP fishing, but it’s also great for long distance paddles (SUP touring) and recreational paddling with additional passengers (dog, friend, significant other). If you want a more well-rounded paddle board, then the Explorer will be a great fit for you. 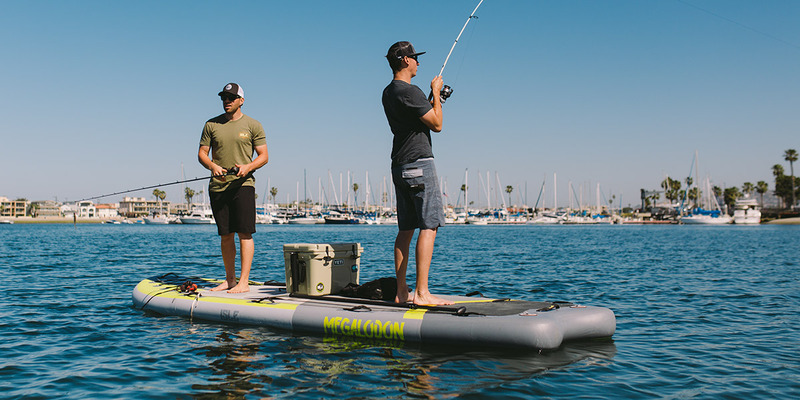 The Megalodon Inflatable Paddle Board is a supersized paddle board (12 or 15 feet) that doubles as a portable fishing dock. This paddle board is 45-56” wide giving you plenty of room on deck for all your fishing gear, cooler, tackle box and even an extra fishing buddy. When you’re not using the Megalodon for SUP fishing, this multi-person inflatable paddle board is great for the entire family, a group of friends, your three dogs or a yoga flow. Fishing paddle boards come in all different shapes and sizes. They come equipped with Scotty Mount attachments, bungee systems and several d-rings to secure your entire fishing setup. Inflatable paddle boards are more effective for SUP fishing because they are more stable, sit higher on the water, are easy to transport and are lightweight. There are many stand up paddle boards that are designed specifically for SUP fishing and there are some that are versatile enough to double as a fishing paddle board.